There’s no shortage of predictions for 2017. From cool tech and funky fashion to moody color palettes, forecasters have weighed in on what we can all look forward to in the new year. On the culinary side, researchers and retailers are anticipating a rise for Coconut. Given the coconut water craze of the last few years, one would think this hard-shelled fruit would have lost her luster by now. Not so. When it comes to food, apparently, there’s always room to grow, even in a seemingly saturated marketplace. The verdict: coconut set to sale higher in 2017! 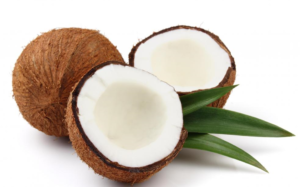 Consumers have had their eye on healthy, organic, cholesterol-free coconut for some time. But how familiar are most with edible coconut – that is, beyond the bars, water and infused products? Here’s a look at some that have been on store shelves for ever, some newer to the marketplace, and what’s projected to give foodies a run for their money. Coconut Milk is a staple in Caribbean cooking. Made from the ‘meat’ of the coconut, the milk is creamy and rich in texture. In Jamaica for example, coconut has never been reserved just for drinking. Coconut milk is used in dishes like Rice & Peas, and in other savory delights of fish, stews, and more. Coconut milk is also a gem in Asian cuisine and is part and parcel in curry and other dishes. Coconut Cream as the name suggests is a creamier, more concentrated version of coconut milk and is used for similar purposes. Both the milk and cream form of coconut has been around for a very long time. Although Coconut Sugar has been popular in other cultures, its rise in the United States is relatively recent. Also referred to as Coconut Palm Sugar, it is mild in taste, has slightly fewer calories than refined sugar, and is regarded as an alternative sweetener. Coconut Sugar is a good source of potassium, zinc and other vitamins and minerals, and goes great in tea, coffee and other beverages that require sweetening. It also serves as a sugar substitute in baking. Although it doesn’t fully replace wheat and grain-based flours, coconut flour is a great partial substitute in baking. Made from the ‘dried’ coconut (oil and fat removed), the flour is high in fiber and protein. Best of all, it is naturally gluten-free. Coconut butter – not to be confused with coco butter, is the smooth, creamy and spreadable finish of the flesh of the coconut. It can be used in place of butter, cream cheese and other spreads. It is decadent, adding amazing taste and texture to smoothies, shakes, and sauces. What’s on tap for next year? Whole foods and exotic foods! Organic, raw, plant-based fruits and veggies like coconut! Enjoy this blog? Share the love!